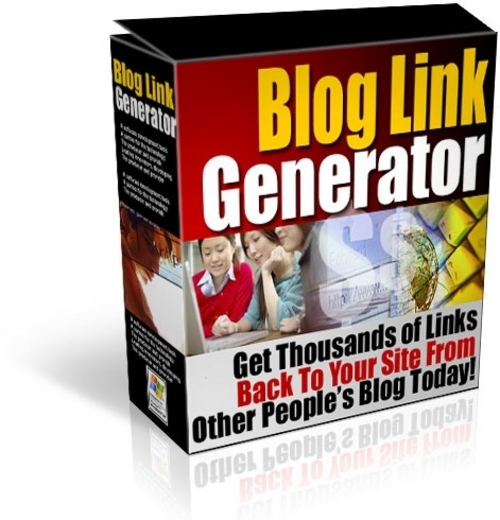 BLOG LINK GENERATOR.GET THOUSANDS OF BACK LINKS!!! Getting link popularity is really hard and time-consuming. But what if you could automate it? Take in keywords you enter OR pull keywords from Google Sandbox or Overture. Use those keywords to find relevant blogs on https://www.tradebit.com. Automatically post your comments to those blogs, including that all-important link back to your site. Think about it. Everybody knows blogging has surpassed e-zines and articles in terms of popularity. Blogs are where people go to get the real scoop on what's going on in today's Internet world. And there are millions of blogs. Now I'm not talking about junk comments- I'm talking real personal comments just like the one's you now post..
What do you think that would do for your site traffic$$$!!! "I just came across your blog about **keyword** and wanted to drop you a note telling you how impressed I was with the information you have posted here. I also have a web site & blog about **keyword** so I know I'm talking about when I say your site is top-notch! Keep up the great work, you are providing a great resource on the Internet here!" Blog Link Generator automatically replaced **keyword** with the list of keywords in the software that are revelant to your site! It could take you hours a day to find relevant blogs and post a comment with a link. Not to mention the carpal tunnel syndrome and eyestrain youll get. Ive been there. I used to spend, like, six hours a day getting keywords from Google Sandbox and Overture, then hunting down blogs with those keywords, and posting comments with a link back to my site. Thats right, $10 an hour. I couldve made more working fast-food. At that point, I realized there had to be a better wayI had to automate this process if I was ever going to make it pay off.